As you can read in my Lenovo Tab P10 review, it offers a lot of good features and is a great value. However, there are some downsides too. 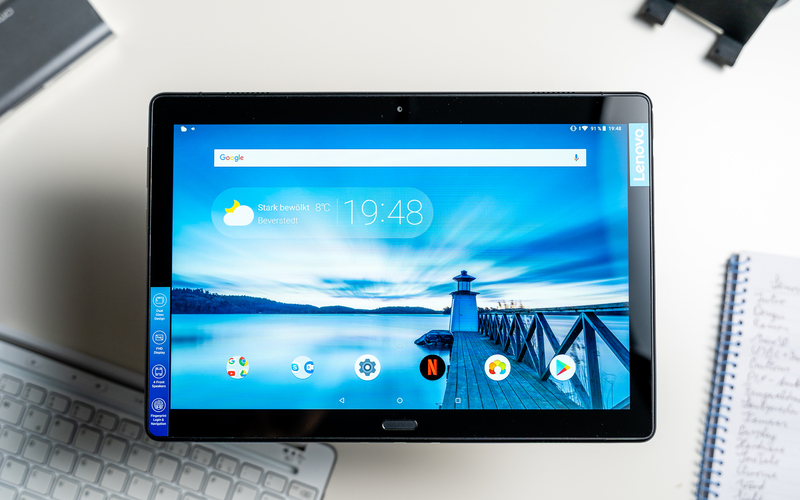 The Lenovo Tab P10 is a 10.1-inch Android tablet that starting at 299 Euros offers middle-class hardware, a high-end design, and lots of premium features. However, in this price range, there is a lot of competition. Among those are the Samsung Galaxy Tab A 10.5 and Huawei MediaPad M5 Lite 10. Well, how good does it hold up against those? I’m Andrzej for MyNextTablet.com and that’s what you’ll find out in my Lenovo Tab P10 Review. Let’s start with the design and build quality. Regarding this, the Lenovo Tab P10 is excellent. While we obviously get a glass front, the tablet also features a glass back. Both glass plates are held in place by a metal frame which is just 7mm thin. When holding it, you get the feeling of holding something expensive even though it is relatively inexpensive. The predecessor had a plastic frame. And while Huawei is using a full metal body, Samsung’s tablet is made of plastic. Well, I really like the design of the Lenovo Tab P10. It looks nice and is premium-feeling. At the same time, it is pretty light at just 440g. You can get it in black and white. On the left side, the tablet features a microSD card slot and a USB C 2.0 port. You can use that port to connect accessories too. We also get a headphone jack. And on the right side, there are a power button and the volume controls. There even is a PIN connector on the bottom which seems to be there for a dock of some kind. However, I don’t have that and didn’t find any dock for this tablet yet. The Lenovo Tab P10 has a fingerprint scanner which is located right underneath the screen. With that one, you can unlock the tablet easily without having to type in a PIN every time. The fingerprint sensor works fast and precise. I really like that the fingerprint reader is supporting gestures. With those, you can replace the home, back, and recent apps buttons. The MediaPad M5 Lite 10 has a fingerprint scanner too but the Galaxy Tab A 10.5 does not. As with those two competitors, the Lenovo Tab P10 has four speakers. Two are located above the screen and two underneath – all of them sit inside the metal frame. The sound quality is very good and certainly better than the sound out of tablets with two speakers. It’s fun to watch movies or listen to music with the P10. On the back, there is an 8-megapixel camera and the front-facing camera has a resolution of 5 megapixels. It’s kind of always the case: Pretty much all smartphones have much better cameras. However, for an Android tablet, the quality out of both cameras is good. The main camera is detailed enough to scan documents with. And the webcam is certainly fine for Skype. The Lenovo Tab P10 has a 10.1-inch screen with an aspect ratio of 16:10. Like is common in this price class, it has a full HD resolution with 1920 x 1200 pixels. And again: As with its competitors, I always think that a full HD display is good enough on 10-inches. However, if you hold the tablet in front of your nose directly, you will see some pixels. Overall, I think the display is very good. It is an IPS panel with good viewing angles, the contrast is good and colors look accurate. And it is great that the screen is laminated. So, there is no annoying air gap. The screen is pretty bright with 400 nits too. And no, the tablet does not support an active pen. The Lenovo Tab P10 ships with a Qualcomm Snapdragon 450 octa-core processor which consist of eight cores. They can run at up to 1.8GHz. Additionally, you can get it with 3GB or 4GB of RAM and a 32GB or 64GB internal storage. As an option, you can get it with 4G. My review unit is the cheapest one with 3GB of RAM. We know the Qualcomm Snapdragon 450 from the Samsung Galaxy Tab A 10.5 already. As I said, that one is a direct competitor. And they score very similar in benchmark tests like Geekbench 4 and AnTuTu. You can see in my comparison that the Lenovo Tab P10 is placed in the middle-class. And that is exactly what it is priced at. I should mention that the Huawei MediaPad M5 Lite 10 gets a bit better result. And it is important to note that the Lenovo Tab4 10 Plus is weaker in AnTuTu but stronger in Geekbench. So, if you own the predecessor already, you won’t get a noticeably better performance with the P10. The performance of the Lenovo Tab P10 is good enough for all everyday tasks. The operating system itself and apps like YouTube, Chrome, and Word run very smoothly. I also edited pictures with Adobe Lightroom and that worked great. The split screen view runs fine with apps like Chrome and Word as well. In my gaming test, the tablet does not score as good as higher-end devices do. Games like Asphalt 8 and Modern Combat 5 run nicely. However, I did notice that Modern Combat 5 does not look as good as it should. Other games like Into The Dead 2 are playable at lowest and medium graphics settings. Another game I tried is PUBG Mobile. I’ve been able to play that one at lowest settings very nicely. And it is smooth at medium graphics as well which are called balanced. In both cases, I noticed very minor lagging only from time to time. So, if you need a great gaming performance, the Lenovo Tab P10 is not for you. But I think it is good enough for most. The Lenovo Tab P10 runs Android 8.1 Oreo out of the box. Will it ever get an update to Android 9.0 Pie? Up until recently I would have said no, certainly not. However, apparently, Lenovo is going to update some of their older tablets from Android 7 to Android 8 this month. So, maybe the P10 will get Android 9 next year? It certainly is not for sure. However, I love that Android 8.1 Oreo is customized very modestly only. It kind of still is vanilla Android, well at least almost. The UI is customized very little at some parts of the operating system only. So, regarding this, I think the P10 is much better than Huawei’s and Samsung’s competition. They customize their UI too heavily. Since it almost is vanilla Android, I don’t have much to say about the software. There are some additional features. For example, you can adjust the sound with the Dolby Atmos app. And there are energy saving modes, a blue light filter and you can turn-off the app drawer. As with its predecessor, there is a kind of desktop mode which is called productivity mode. Once you activate it, you kind of get a taskbar like on Windows on the bottom. That’s where you can find the typical Android buttons and currently opened apps. While it is interesting, the interface is not as complex as Samsung Dex or the Huawei Desktop-Mode are. For example, apps are still opened full-screen or using the standard split-screen view. Somehow, I never think that these modes are that useful on Android. On the other hand, I like that not that many apps are pre-installed. There are a couple of standard apps like the ones from Google, as well as Skype and Outlook from Microsoft. We also get an FM radio and an audio recorder. But that’s it and that is great. In total, I much prefer Lenovo’s software over the UI’s from Samsung and Huawei. Because it is very minimalistic with pretty much vanilla Android. I did stumble upon one negative point though. It seems like the Lenovo Tab P10 does not have the necessary DRM rights to play Netflix in HD or higher. Netflix works, obviously, but you can’t watch movies or TV shows in HD. Some manufacturers did solve that with updates in the past. So, maybe Lenovo will do that. The Galaxy Tab A 10.5 has the same issue, but you can watch HD Netflix on the MediaPad M5 Lite 10. In my standard battery test, the Lenovo Tab P10 got a runtime of 11.5 hours. For this, I’m always looping an HD video at 50 percent brightness for all my reviews. Those 11.5 hours are a good, but certainly not a very good result. Yes, there are a lot of tablets with a worse battery life but also quite a few that last a bit longer. Among those are both competitors from Huawei and Samsung. Alright, that’s my Lenovo Tab P10 review. Is it a good tablet? Considering its price, the build quality is excellent, and the design looks very nice. The screen is great, the speakers sound nice and the fingerprint scanner is good. The performance of the Snapdragon 450 is good enough. However, you won’t really notice a difference compared to the predecessor. I love that Android Oreo is almost not customized at all. Sadly, you cannot watch Netflix in HD. At least not yet. If you don’t mind that, I certainly can recommend the Lenovo Tab P10. It is a nice tablet and I enjoyed using it. But because there are a lot of competitors, we also should take a look at a couple of alternatives. A very similar tablet is the Samsung Galaxy Tab A 10.5. While the internal hardware is the same and the screen has the same resolution, it is just a bit bigger with 10.5 inches. Sadly, it has a full plastic body only and no fingerprint scanner. But it will probably get updates much longer. Well, mainly because of the missing fingerprint reader, I would prefer the Lenovo Tab P10 if the prices are the same. The Huawei MediaPad M5 Lite 10 is a very interesting alternative. With this one, we do get a full metal body and the performance is a bit better. Other features like the screen, fingerprint sensor, and the four speakers are very similar. It is important to note that the MediaPad can play Netflix in HD. And you can get it with an optional pen. However, like with Samsung, the UI is much heavier customized. So, you have to decide for yourself which features are more important to you. While it is a bit pricier, the Apple iPad 2018 is another direct competitor to those three Android tablets. The iPad features a good build quality, a fingerprint scanner and an optional stylus. And especially the performance is much better. Yes, if you are watching this video, you’re probably looking for an Android tablet. But the iPad offers a very good value and you should at least consider it. Lenovo Tab P10 Review:The Lenovo Tab P10 has a lot of good premium features at an affordable price. In fact, the speakers, the fingerprint scanner, and the design quite high-end. Other aspects like the display and performance are good too. Sadly, you cannot watch Netflix in HD though. Otherwise it's a good value.